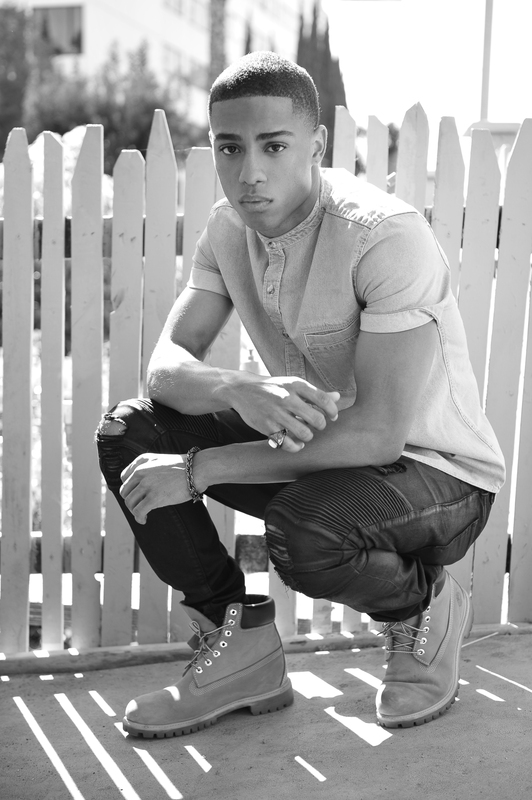 Keith Powers is a leading man on the rise. He is in the series, “Sin City Saints”. You may have also seen him in “Fear The Walking Dead”, and “Straight Outta Compton”. You can catch him in MTV’s “Faking It”, which is back for the back half of season 2 tonight. First things first Keith, can you tell us a bit about your life growing up in Sacramento? Growing up in Sacramento was a blessing to me because it keeps me grounded. I come from humble beginnings. I also appreciate being from the capital of California. Only things is, it is easy to become close minded as well. Where I grew up in Sacramento, you were either playing sports, in the streets, or a scholar. Growing up I did not do the little things like go fishing, camping, ski trips, etc. My family was a very athletic type family so my childhood consisted of of sports and cartoons. Talk a bit about your start in modeling and your transition to acting. I started modeling when I was 9 actually, then I stopped to continue to play football. My mom wanted me to pick between the two, and at the time sports was more appealing. Then after highschool things did not work out with football, so I decided to get back into modeling. I got signed by JE Model SF in San Francisco then later signed to Wilhelmina LA. I then signed to my commercial agency HRI Talent. So “Faking It” is back. What can people expect from the second half of Season 2? Should we expect to see your character in season 3? People can expect new characters, more drama and more fun. We will have to see! You’re in the Yahoo series, “Sin City Saints”. Can you describe your role and the premise of the series for those who have not yet been introduced to it? I play a NBA rookie superstar point guard on an expansion team in Las Vegas. It is based around an Las Vegas basketball team and the owner Jake Tullus, who is an internet billionaire that decided to purchase a Vegas NBA basketball team. He soon finds out it is harder than he expected. What do you like about your character LaDarius? I like the fact that he is this superstar but also in reality he is young, naive, a helpless romantic, bratty and sensitive. He is very opposite to me in real life and it is cool to play both those dynamics. What was it like filming “Sin City Saints”? How long did it take to finish filming the entire season? It was fun filming Sin City Saints, I loved shooting in Vegas! It took close to 8 weeks to finish the season. As a boxing fan and one of Floyd Mayweather Jr. How did you feel about the mega fight this past May? The fight ended up being just how I expected. I think people overhyped the fight because we thirst for it for so long and that is why a bunch of people were mad about the outcome. Who do you listen music to get inspired whether it’s before a shoot, filming, ect? I listen to all different type of music to get inspired before shoots, etc. But right now I have been listening to Future’s ’56 Nights’ mixtape. You were in the movie “Straight Outta Compton.” This is a monumental and successful film and story told about the legendary group. How did it feel being a part of this moment? It feels amazing and it’s an honor. I am so grateful and appreciative to be a part of something like this. You also appeared in the first episode of “Fear The Walking Dead,” and helped usher in a new era. What can tell us about the experience, atmosphere of the series? The atmosphere was one of the best I have ever witness since acting. What are some roles that you hope to see yourself doing five years from now? Biopics, different things you would not normally expect me to be in. And comedies! Leonardo Di Caprio, Brad Pitt, Will, Denzel, Michael B Jordan, Margot Robbie, Sandra Bullock, Natalie Portman, Anthony Mackie, Chadwick Boseman, the list goes on! What is a fun fact that not many people know about you? Fun fact is I love cereal and video games. LOVE. Most embarrassing moment is every time I fell while running in high school. That is the worst. What is your personal style? Can you also talk a bit about SOAH? I like the European look mixed with the urban California feel. Soah is a brand I created when I was 19. Thank you for your time Keith, is there anything that you would like to say to your supporters and our readers? Hard work is undefeated. Stay humble and stay unsatisfied, but grateful and appreciative. Also, Integrity is everything.